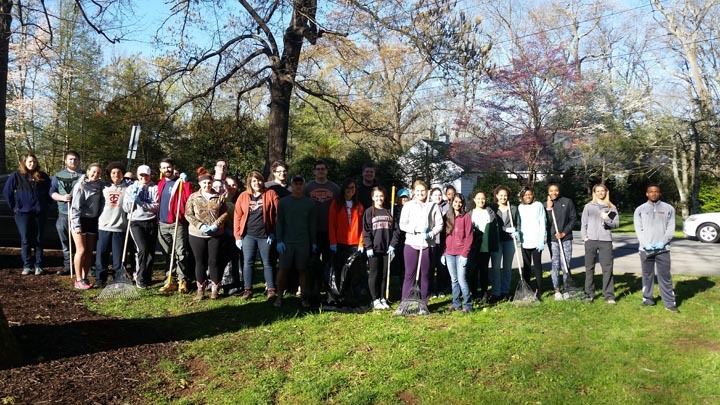 On Wednesday, April 13, 29 biology/service-learning students from Tusculum College participated in a stream clean-up of College Creek and the Paul E. Hayden Educational Wetland. The Hayden Wetland is a man-made, stormwater wetland that filters out nutrients and pollutants, catches stormwater runoff and litter and helps clean the water before it goes into College Creek. The event was hosted by the Middle Nolichucky Watershed Alliance. Students were divided into two groups, with half cleaning the creek section near the Doak House Museum and half removing debris and litter from the wetland area and along the creek between Gilland Street and Shiloh Road. Water from College Creek eventually drains into the Nolichucky River. With College Creek being 1 of 58 impaired tributaries flowing into the Nolichucky, it is critical for members of the community to practice environmental stewardship. Students also learned about how to save on water and energy consumption in their daily lives. Pizza, drinks, t-shirts and rakes were provided by a Tennessee Wildlife Resources Agency grant. Gloves and trash bags were provided by a Tennessee Valley Authority Community Clean-up grant and through Keep Greene Beautiful. For more information on adopting a local stream in your area, please contact Appalachia CARES/AmeriCorps Member Kristen Lane at mnwa.tn@gmail.com.